Looking at a map of Israel in relationship to the Arab world and Iran tells us that Arabs and Iranians don't need land; they need tolerance. There is no shortage of land. There is a shortage of freedom. 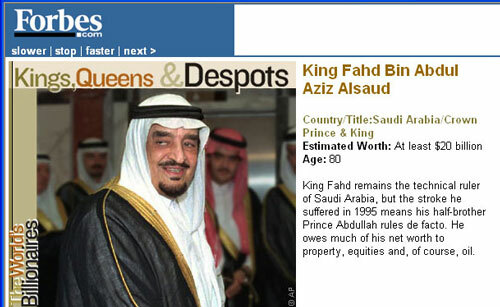 A real War - Fighting the worst fascists since Hitler - Arab Rulers: Thieves, Agents, Slaughterers, and Contemptible - Arab despots star in Forbes Report 2003 "The World's Richest People"
Arab League asserts right to 22nd Arab state, 2nd one in Palestine. In 1964, the Arab League founded the Palestinian Liberation Organization (PLO) whose raison d’etre was to destroy Israel, three years before the West Bank and Gaza Strip came under Israeli control. The Case for Democracy - Democratically governed nations are more likely to secure the peace, deter aggression, expand open markets, promote economic development, protect Western citizens, combat international terrorism and crime, uphold human and worker rights, avoid humanitarian crises and refugee flows, improve the global environment, and protect human health. Arab countries and Iran among the wealthiest in natural resources and the poorest in human resources. Arab and Iranian dictators' propaganda is insidious: sponsors of terrorism establish human rights organizations, victims are turned into aggressors and savages, barbarians are painted as victims, imperialists and warmongers are declared moderates, defense is aggression, offense is defense, democrats are denounced as imperialists, dictators are lauded as democrats, and there are no problems that could not be resolved through the destruction of Israel, the Middle East’s sole democracy. 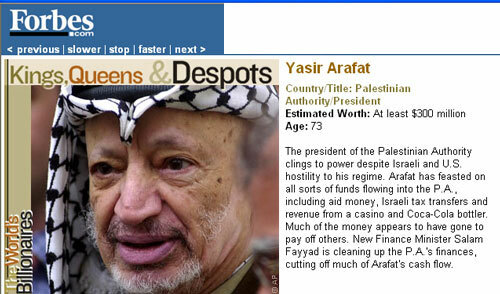 Yasser Arafat ‘has £1.8bn fortune’ (William Tinning, The Herald, Nov 7, 2003): "... [Arafat] has amassed a personal fortune of between £602m and £1.8bn. ... Arafat's wife, Suha, 40, who lives away from the struggles of her homeland, is given more than £60,000 a month from Palestinian Authority funds." Shaking Up the Neighbors (Thomas L. Friedman, The New York Times, Aug 6, 2003): "Shortly after the 25-member Governing Council was appointed in Iraq, the head of the Arab League, Amr Moussa, questioned the U.S.-appointed Council's legitimacy. "If this Council was elected," complained Mr. Moussa, "it would have gained much power and credibility." I love that quote. I love it, first of all, for its bold, gutsy, shameless, world-class hypocrisy. Mr. Moussa presides over an Arab League in which not one of the 22 member states has a leader elected in a free and fair election." A Popular Idea: Give Oil Money to the People Rather Than the Despots (John Tierney, New York Times, Sep 10, 2003): "The studies have shown that resource-rich countries in the Middle East, ... are exceptionally prone to authoritarian rule, slow economic growth and high rates of poverty, corruption and violent conflict. Besides financing large armies to fight ruinous wars with neighbors, as in Iraq and Iran, oil wealth sometimes leads to civil wars over the sharing of the proceeds, as in Sudan and Congo." Saudi religious and morality police launch website (MEMRI, May 13, 2003) : "... the arrest of an Asian man belonging to the Sufi sect of Islam who "engaged in witchcraft," a study on the role of the Authority in the struggle against "ideological invasion, ... On the photo, under the heading "The Jewish Doll," is a story titled "The Strange Request." The story reads: "One girl said to her mother: 'Mother, I want jeans and a shirt open at the top, like Barbie's!!' The dolls of the Jewish Barbie in her naked garb [sic], their disgraceful appearance, and their various accessories are a symbol of the dissolution of values in the West. We must fully comprehend the danger in them." These pictures are not suitable for children. They are extremely disturbing!!! Thank You . An Iraqi poet celebrates the dictator's fall. (Awad Nasir, Wall Street Journal, May 8, 2003): "It is not only the people of Iraq who are grateful for the end of a nightmare. A majority of Arabs and Muslims are also grateful. The chorus of lamentation for Saddam consists of a few isolated figures espousing the bankrupt ideologies of pan-Arabism and Islamism. A Moroccan Islamist tells us that the American presence in Iraq is "a punishment from Allah" for Muslims because of their "weakening faith." But if the toppling of a tyrant is punishment, then I pray that Allah will bring similar punishments on other Arab nations that endure despotic rule." Belkacem Lounes, president of the USA-based World Amazigh [Berber] Congress, wrote an open letter to Libyan leader Mu'ammar Qaddafi (MEMRI, May 3, 2007): "... ... 30 Million Amazigh Speakers in North Africa ... We like to think that colonialism no longer exists… But there is no worse colonialism than internal colonialism - that of the pan-Arabist clan that seeks to dominate our people. It is surely Arabism, in that it is an imperialist ideology that refuses any diversity in North Africa, that constitutes a betrayal and an offense to history, truth, and legality." "1) Speaking of withdrawal from Iraq, shouldn't the Arab League be asking Syria — a League member — to withdraw from Lebanon? That small country was invaded in 1990 by an Arab army following an Arab League decision — which, let us remind Mr. Mahmassani, was never authorized by the United Nations. Since 1976, the Arab League has sponsored armed interventions in Lebanon quite independently of the U.N. Worse, it legitimized the onslaught of the Syrian forces in Lebanon — complete with 15 years of shelling, massacres, kidnappings, and terrorism, and the forceful imposition of a new regime in October 1990. 2) The League's representative warned against the "harm that could be caused to the peoples of the region." But the League shows such thoughtfulness only to certain populations. Kurds are not on its list, nor are the Berbers or the Copts. The Kurds are massacred by the Iraqi regime, the Algerian government suppresses the Berbers, and the Copts are persecuted by both their own Egyptian government and by fundamentalist organizations. The list goes on. Despite a range of atrocities stretching from the Atlantic to the Indian Ocean, the League has remained heavily silent. 3) Last but not least, the Arab League charges that its people do not want change, especially if it comes from the outside world, and particularly if it is to be at the hands of the United States. It claims that Arab matters are settled among and by Arabs. But if that's the case, why don't we call for free elections in Damascus, Riyadh, and Tripoli, and learn more about the real will of the people of the region? Let's grant the masses there what the League wants to grant the Palestinians — nothing more, nothing less. Why should the United States be urged to intervene in one Arab matter (the Palestinian one) and not in another one (Iraq)? Are the Kurds and Shiites second-class communities?" Arab League Revives Boycott Against Israel (Shearman & Sterling LLP, Jan 2, 2004): "On March 28, 2001, at a two-day summit in Amman, Jordan, Arab heads of state adopted a resolution calling for the reactivation of the Arab boycott against Israel. In response, U.S. antiboycott laws are expected to be more vigorously enforced in order to counteract any enhancement of the Arab boycott that may result from this resolution. The resolution directs the Arab League's Central Boycott Office (CBO) in Damascus, Syria, to hold regular boycott conferences with the aim of preventing dealings with Israel." Article (12): Complete liberation of Palestine, and eradication of Zionist economic, political, military and cultural existence. Arab democratic reform. Arab reform, or Arab performance? (Economist, Jul 17, 2003): "Across the region, including Iraq, the Islamist trend remains the one most likely to succeed in open elections. ... Arab regimes are simply too addicted to power. They can make the right gestures, but even a small relinquishment of authority produces ugly withdrawal symptoms." Tunisian Intellectual Al-Afif Al-Akhdar On the Arab Identity Crisis and Education in the Arab World (Elaph.com/MEMRI Sep 21, 2003): "Why is it that our countries are among the wealthiest in natural resources... and the poorest in human resources? Why does the world's human knowledge double every three years... while with us, what multiplies several times over is illiteracy, ideological fear, and mental paralysis? Why do expressions of tolerance, moderation, rationalism, compromise, and negotiation horrify us, but [when we hear] fervent cries for vengeance, we all dance the war dance? Why have the people of the world managed to mourn their pasts and move on, while we have established, hard and fast, our gloomy bereavement over a past that does not pass? Why do other people love life, while we love death and violence, slaughter and suicide, and [even] call it heroism and martyrdom...?" Self-determination for me, not for thee (Professor S. Avineri, JP, May 17,2004): "The issue is that the Arab political narrative sees the Arab nation – and it alone – as the sole legitimate repository of national self-determination in the region. While Arabs have, of course, the right to self-determination, one of the problems that have accompanied Arab nationalism from its inception is that what the Arabs rightly claim for themselves, they are not willing to grant to other national groups in the Middle East. This exclusivism borders on political racism. The Kurds are one example. Different in language, culture, and traditions from the Arabs, Kurds have been oppressed for decades ..."
"Fighting Corruption [in the Arab World] is Like Fighting Catholicism in the Vatican." (Excerpts from an article by Dr. Abd Al-Wahhab Al-Effendi, a Sudanese author and researcher who resides in London, appeared in the London-based Arabic-language daily Al-Hayat, MEMRI, Aug 14, 2002). Why do Arabs Hate the West, Especially the U.S.? (MEMRI, Aug 12, 2003): Zuheir Abdallah, columnist for the London-based Arabic daily Al-Hayat, blames Arab fascism and Islamism for failing to achieve any accomplishments for the Arab world since 1948, leading to its backwardness today. "Most Arabs hate the West, especially the U.S., for many reasons; some date back to the Crusades and the Andalusia period, and more recently, because of Palestine and Iraq. I don't intend to delve into this historical turmoil, but for the sake of history, the Arabs should remember that they invaded and occupied important parts of Europe hundreds of years before the Crusades wars. ... Let us stop for a minute and ask ourselves, Arabs and most Muslims, what did we offer for ourselves and the rest of the world, since the beginning of the industrial revolution to this day, from human sciences and inventions or any other added value to civilization? Unfortunately, the answer is: almost nothing!" President Bush Presses on Peace and Liberty in the Middle East, May 9, 2003: "After September the 11th, 2001, your generation and our whole country knows better. In an age of global terror and weapons of mass destruction what happens in the Middle East greatly matters to America. The bitterness of that region can bring violence and suffering to our own cities. The advance of freedom and peace in the Middle East would drain this bitterness and increase our own security ... Free governments do not build weapons of mass destruction for the purpose of mass terror. Over time, the expansion of liberty throughout the world is the best guarantee of security throughout the world. Freedom is the way to peace ... The Middle East presents many obstacles to the advance of freedom. And I understand that this transformation will be difficult. Recently, a group of 30 Arab scholars issued a report describing a freedom deficit in Arab countries, citing in particular a lack of human rights and poor education. They also identified the social oppression of women as a major barrier to progress. And they are correct. No society can succeed and prosper while denying basic rights and opportunities to the women of their country." Why Arabs love Israel (Joseph Farah, WND, Apr 9, 2003): "Arabs in Israel vote. They elect leaders to the Knesset [Israeli parliament]. They have their own political parties. They have their own newspapers. They have full rights to citizenship. They are free to speak their minds. As an Arab-American journalist who has spent a good deal of time covering the region, I can tell you there is more freedom for Arabs in Israel than in any Arab state." In Lebanon, don’t try speaking out against the Syrian occupation. You won’t live long. In Saudi Arabia, don’t try converting from Islam. You won't live long. In Somalia, don’t try refusing sexual mutilation of your sister. She and you won't live long. In Tunisia, don’t try saying the government is corrupt. You won't live long. In Egypt, don’t try being a homosexual. You won't live long. In Sudan, don’t try being a separatist. You won’t live long. In Iran, don’t try having an affair. You won’t live long. In Iraq, don’t try to be a party activist. You won’t live long. In Algeria, don’t try to be suspected of Islamism. You won't live long. In Libya, don’t try asking about her role in international terrorism. You won’t live long. In Mauritania, don’t try helping a slave run away. He and you won’t live long. In Syria, don’t try throwing stones at police. You won't live long. In Oman, don’t try demonstrating for women rights. You won’t live long. In Morocco, don’t try saying Arab Saharawis have been displaced. You won’t live long. In Yemen, don’t try apostasy. You won’t live long. In the Palestinian Authority, don’t try supporting democratic Israel. You won’t live long. The End of 'Arafat'. Even if he lives, the idea of him must die. (Wall Street Journal, Sep 17, 2003): "If you look at the Nobel Prizes' own biography of Yasser Arafat, you find this remarkable sentence toward the end: 'Like other Arab regimes in the area, however, Arafat's governing style tended to be more dictatorial than democratic.' That is to say, Arafat by his own choice of governance--dictatorship over democracy--bears individual responsibility for the legacy he leaves. That legacy includes: the contemporary crime of hijacking and blowing up civilian-filled airliners; the attempted destabilization of Jordan and Israel and the successful destruction of Lebanon as a formerly sovereign nation; and decades of violated international agreements, culminating in the collapse of Oslo. ... has made possible any crime, culminating in the anti-moral act known as suicide bombers." Assad's Regime More Criminal than Saddam's Regime. Ahmad Al-Jarallah, editor of the Kuwaiti daily Al-Siyasa, wrote a series of articles which were critical of the Syrian regime (MEMRI, Apr 22, 2003): "Syria, and with it the same supporters and mercenaries, say that it is a Zionist game, and that Iraq was conquered by the American-Israeli forces. It says that the U.S. is carrying out a Sharonist program in this country, the goal of which is to impose Pax Israeliana on the region, and every one of the statements are part of the game of cat and mouse and are aimed at gaining time. What is demanded from Syria is self-examination that will show that the Damascus regime suffers greatly from sadistic behavior, and that it is identical to Saddam, in the parameters of dictatorship, of single-party rule, and in its refraining from development, change, and adopting the principles of freedom and democracy." President Bush's call of June 24, 2002 to the Palestinians, to dismantle the terrorist infrastructure, end incitement to violence in official media, elect new leaders not compromised by terror, and embrace democracy. Israel Comparison Maps (IRIS): Compare the map of Israel with maps of other areas drawn to the same scale, to put Israel's size into perspective. In these maps, Israel is portrayed including all land currently under its authority. Still, Israel is small compared with most countries around the world, most states in the U.S. and most other countries in its region. SOS Slaves website (Sep 15, 2003): "Founded in 1995, SOS Slaves is a human rights organization dedicated to eradicating chattel slavery in Mauritania. ... the Mauritanian government banned SOS Slaves and arrested several of its leaders. ... Slavery has been a part of Mauritanian society for centuries. Over 800 years ago, Arab and Berber tribes descended from the Mediterranean peninsula and launched slave raids against the indigenous African population, abducting women and children as slaves. Those enslaved were converted to Islam and raised to believe that their religious duty was to serve their masters faithfully. The relationship of master (bidanes) and slave (haratines) continues to this day, with thousands of haratines families owned as inheritable property by bidanes and denied basic human rights by Mauritania's Islamic courts." UN Arab Human Development Report 2002. Read/download the complete 178 pages report in one big file (5,209 KB) which the UN has commissioned from a group of distinguished Arab intellectuals: The GDP of all 280 million Arabs combined is less than what the 40 million inhabitants of Spain produce. The 280 million-people-Arab-world translates about 300 books annually - this is 20% the number that the 10 million-people-Greece alone translates!!! Freedom scores of ALL Arab states: Better don't ask ... Interestingly, while the category "Occupied Palestinian Territory" is included in practically ALL comparison tables of the report, most of the PALESTINIAN DATA IS MISSING. Why? One must conclude that the comparison of the Palestinian with the other Arabs' data would rather indicate that the Palestinians live in a paradise, compared with most other Arabs, and that the allegedly poor and desperate Israel-repressed Arabs in the "Occupied Palestinian Territory" are simply the richest, most educated, healthiest and freest Arabs in the neighbourhood. However, the report reveals SOME of the Palestinian data: See for yourself that the allegedly poor and desperate Israel-repressed Arabs in the "Occupied Palestinian Territory" have the highest annual growth rate (4.78% p.a.) of ALL Arab states, and twice as high as the average of ALL neighbouring states (Jordan: 2.90, Egypt: 1.82, Lebanon: 1.97, Syria 2.59). One must conclude that Israeli health care is good for Arabs' growth ... Number of frequently cited scientific papers per million people: Egypt: 0.02, Israel: 169 - this is 8,500 - eightthousandfivehundred - times more than in Egypt, and 17,000 times more than Algeria. The rest is history ... So why does Palestinian society appear to be suicidal? That's a long story, but remember most advanced and sophisticated Germany and Japan trying very hard to destroy their neighbourhood and disgracing themselves. The USA/GB liberated these people from their own dictators and their "occupation" resulted in democratic education, free press, free market etc. Within a decade, the German and Japanese people became most respected partners and even allies of their former enemies. Arab development. 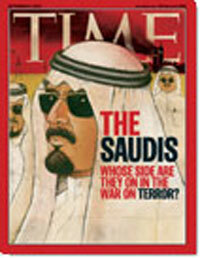 Self-doomed to failure (The Economist, Jul 4, 2002): "WHAT went wrong with the Arab world? Why is it so stuck behind the times? It is not an obviously unlucky region. Fatly endowed with oil, and with its people sharing a rich cultural, religious and linguistic heritage, it is faced neither with endemic poverty nor with ethnic conflict. It shook off its colonial or neo-colonial legacies long ago, and the countries that had revolutions should have had time to recover from them. But, with barely an exception, its autocratic rulers, whether presidents or kings, give up their authority only when they die; its elections are a sick joke; half its people are treated as lesser legal and economic beings, and more than half its young, burdened by joblessness and stifled by conservative religious tradition, are said to want to get out of the place as soon as they can. Across dinner tables from Morocco to the Gulf, but above all in Egypt, the Arab world's natural leader, Arab intellectuals endlessly ask one another how and why things came to turn out in this unnecessarily bad way. A team of such scholars (it is indicative of the barriers to freely expressed thought that there are almost no worthwhile think-tanks in the Arab world) have now spent a year putting their experience to diagnostic use in the “Arab Human Development Report 2002”, published this week by the United Nations Development Programme (UNDP)." Israeli Arab Intellectual and Poet on Illiteracy in the Arab World, "Backward-Looking" Islam, and the Complex of Arab Secularists (MEMRI, Mar 31, 2004): "The Arab world does not read. According to various reports, the Arab world is largely illiterate. ... A book selling 5,000 copies across the Arab world is a rare achievement. The average book published in Israel sells more copies than a successful book in the entire Arab world. ... "We here [in Israel], with all our problems, and all the complexity of our situation, know deep inside that we are free, I mean, as far as thinking goes, and as far as the possibility of writing goes. We are freer to think than anyone in the Arab world. ... All of Arab history is built on war crimes. There is practically not a single Muslim caliph who was not murdered." Hatred of Israel is a crutch Arab states have to give up (Ruth Wisse, Wall Street Journal, Jun 16, 2003): "At any point during the past 55 years, Arab governments could have helped the Palestinian Arabs settle down to a decent life. They could have created the infrastructure of an autonomous Palestine on the West Bank of the Jordan and the Gaza territory that Egypt controlled until 1967, or encouraged the resettlement of Palestinians in Jordan, which constitutes the lion's share of the original mandate of Palestine. Rather than fund the Palestine Liberation Organization to foment terror against Israel they could have endowed Palestinian schools of architecture, engineering, medicine and law. What Israel did for its refugees from Arab lands, Arabs could have done much more sumptuously for the Palestinians displaced by the same conflict. Instead, Arab rulers cultivated generations of refugees in order to justify their ongoing campaign against the 'usurper' ... In almost identical ways [to the Nazis], the autocrats who govern Arab societies have used the "Zionist entity" to deflect attention from the worst aspects of their rule. The unwanted presence of the Jews became the rallying point for internal dissatisfaction with the mounting problems of Arab regimes. The drumbeat against Israel invited the world to debate the iniquities of the Jews rather than question the legitimacy of the attacks against them. This comparison is not intended to equate the Germans with the Arabs, except in the ways that both exploited anti-Semitism to achieve broader political goals. Both used the alleged threat of "the Jews" to excuse their own failures. Anti-Semitism in both situations linked otherwise warring groups of the Left and Right. The problem with anti-Semitism in its older and newer varieties is that it seems to serve its patrons so well. Without question, Arab rulers successfully deflected attention from their offenses by their decades of war and propaganda against Israel. Even the liberal Western media that might have been expected to support a besieged fellow democracy have long since focused on alleged Israeli abuses instead of on the abuses of their Arab accusers." One Purely Evil Cartel. Iraq's liberation is the perfect opportunity to smash OPEC (Claudia Rosett, Wall Street Journal, Jul 30, 2003): "Though there are many polite ways in which OPEC is usually described, it would be accurate to sum up this outfit's activities as follows: a gang of price-fixing, oil-rich thug regimes that meet to reinforce assorted terrorist-sponsoring tyrants and gouge consumers. ... The Saudis are, of course, entitled to offer oil at any price they want, including the OPEC target price of $22 to $28 a barrel for oil that costs them $1 to $2 a barrel to produce. But the Saudi-led collusion that goes into keeping world oil prices high enough to command prices that OPEC deems "fair and reasonable" is the kind of stuff that would get private capitalists in the U.S. fried on prime-time TV and thrown in prison. ... Oil in any nation is a perilous treasure, but especially so when it is entirely owned or controlled by the state. In government hands, in large quantities, oil wealth helps rulers consolidate control to a degree that in Saudi Arabia today funds the totalitarian state--with its export of its Wahhabi terrorist creed. 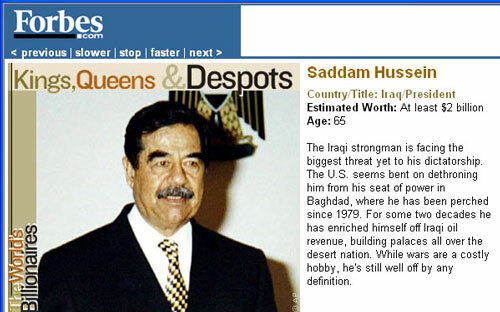 In Iraq, the state oil monopoly sustained Saddam Hussein. Huge oil revenues relieve the rulers of the need to negotiate with their subjects any sort of mutually acceptable tax system. Instead, oil tyrants are in a position to govern chiefly by bribe and threat. The result is stunted development, both political and economic. Saudi Arabia's per capita income, despite the country's vast oil wealth, has been shrinking for years. OPEC's overall rate of economic growth this year is estimated by its own analysts at 1.4%, or less than half the world average of 2.9%." Saudi Arabia's Overrated Oil Weapon (Max Singer, Weekly Standard, Aug 18, 2003): "OVERESTIMATES OF ARAB OIL POWER are an important and harmful influence on policy toward the Middle East. The following myths, or outdated facts, support the world's misjudgment of the power of the Persian Gulf oil producers--especially Saudi Arabia, but also Iran, Iraq, and the Gulf states." Iran clarifies the Middle East (Dennis Prager, WND, Dec 30, 2003): "If you want to understand the Middle East conflict, Iran has just provided all you need to know. A massive earthquake kills between 20,000 and 40,000 Iranians, and the government of Iran announces that help is welcome from every country in the world ... except Israel. This little-reported news item is of great significance. It begs commentary. Israel not only has the world's most experienced crews in quickly finding survivors in bombed out buildings, it is also a mere two-hour flight from Iran. In other words, no country in the world would come close to Israel in its ability to save Iranian lives quickly. But none of this means anything to the rulers of Iran. The Islamic government of Iran has announced to the world that it is better for fellow countrymen and fellow Muslims – men, women and children – to die buried under rubble than to be saved by a Jew from Israel." Human Rights and Human Wrongs. Sharia can’t be an exception to international human-rights norms. (David Littman, NRO, Jan 19, 2003): "The principal aim of the 1948 Universal Declaration of Human Rights (UDHR) was to create a framework for a universal code based on mutual consent." Al-Qaddafi: 'Libya Should Quit the Arab League... Women Must be Trained to Booby-Trap Cars, Houses, Luggage, and Children's Toys' (Al-Shams (Libya), October 5, 2003 - MEMRI, Oct 10, 2003): "The Palestinians and the Lebanese – we sacrificed our blood for them, we gave them our money, we gave them everything. We held training for them and ultimately it turned out that we were terrorists, while they embrace the Americans, the Israelis, and the Westerners, Libya is [accused of] terrorism because it trained the Palestinians. We fulfilled our obligation, we gave our money, we gave them weapons, we exposed ourselves to dangers, [and] we are on the blacklist to this day… The Arabs are completely useless. They are unwilling to do anything for the sake of unity. ... There are nations to which I did an injustice and I apologize for this. I brought Mauritania, Djibouti, Somalia, and the Comoro Islands into the Arab League, and I tried to bring in Eritrea. But now I cannot speak with Eritrea. Look what an injustice I did them. I brought them into a failed nation, a failed regime, and failed people…. The Arabs are completely useless. We must not waste time. The Arabs are through. ... I ask of the Libyan people to agree to quit the Arab League, without wasting time. These people [i.e. the Arabs] are useless. Their situation is terrible. We must be rid of them, of their curses and of their problems. Let them go in peace. They won't talk to us and we won't talk to them. Even the Arab League is nothing. It has been four months since its officials received their salaries, because the Arab countries refrained from paying their membership dues…We must train the women how to booby-trap the car and blow it up among the enemy, how to blow up the house so it falls on the enemy soldiers. Traps must be prepared. You have seen how [the enemy] check[s] luggage. These suitcases should be rigged so that when they open them they blow up. The women must be taught how to booby-trap their clothes closets, booby-trap their purses, booby-trap their shoes, booby-trap the children's toys, so they blow up on the enemy soldiers." FREEDOM FIGHTERS. Reviving Mideastern Democracy. We Arabs need the West's help to usher in a new Liberal Age (Egypt-based Saad Eddin Ibrahim, Wall Street Journal, Nov 26, 2003): "Democracy is the way forward. It is the only sure way to keep the Middle East from going to the brink of war every few years. In an article recently published in the Washington Post, I counted the number of times that the United States or other Western powers have had to form military coalitions or use large-scale armed force in the region to avert or resolve a problem. From 1958, when President Eisenhower sent U.S. Marines to Lebanon, up through the Iraq war of 2003, the rate of military interventions has averaged one every seven years. God knows when the next one will be, but without democracy they are sure to continue, and that is no light matter. It is time for us as Arabs to put our own houses in order. There are a thousand and one difficulties facing us as we work to institute democracy in the Arab world and the larger Middle East. And yet what choice do we have except to try once, twice or as often as we must? Government by consent, respect for human rights, and support for the rule of law are the only things that can finally and securely protect our countries, our region and the world against the threats of terrorism and of crises that compel outsiders to come and use military force on our shores. How do I rate the prospects for democracy in the Middle East? I think that they are surprisingly good. I am well aware of those who marshal evidence to show that instituting democracies and open societies in the region, or perhaps even in the larger Muslim world, is difficult or impossible. The difficulties are well known and undeniable. But they can all be overcome. In previous decades, authoritative voices said that Germany, Japan, Slavic countries and even Catholic societies would never, could never, be democratic. I am not speaking of popular prejudices here, but of high-level scholarship and expert consensus. Batteries of learned naysayers honestly believed that there was something about German, Japanese or Slavic culture, or about Catholicism, that was fundamentally and unchangeably hostile to democracy and democratic values." From Arafat to Nasrallah: How Misperceptions of Israel Shape Arab Strategy (Prof. Barry Rubin, Aug 7, 2006): "One of the most remarkable aspects of the current fighting and rise of radical Islamist groups in the Middle East is how faithfully it sets the clock back by 40 years. When Hizballah's leader, Hassan Nasrallah, and other extremist Islamists speak, they echo word for word what Yasir Arafat and Arab nationalists said in the 1960s. The ideas, analysis, and tactics are almost precisely the same. Basically, it boils down to this: If Arabs (Muslims) are only ready to become martyrs and sacrifice everything in all-out war, wiping Israel off the map is easy. Israel has only continued to exist because Arab rulers were too cowardly and traitorous up to now. In short, Israel is a paper tiger. Let's light a match." United Arab Republic (Columbia Encyclopedia, June 6, 2004): Political union (1958-61) of Egypt and Syria. The capital was Cairo. As an initial step toward creating a pan-Arab union, the republic abolished Syrian and Egyptian citizenship, termed its inhabitants Arabs, and called the country “Arab territory.” It considered the Arab homeland to be the entire area between the Persian Gulf and the Atlantic coast. With Yemen (North Yemen), it formed (1958) a loose federation called the United Arab States . In 1961, Syria withdrew from the union after a military coup, and Yemen soon followed, thus ending the union. Egypt continued to use the name until 1971. List of Journalists in Prison in the Middle East and North Africa (CMF MENA, Jul 3, 2004): "CMF MENA has a record of 23 journalists in prison in different countries in the region. There are many more that we do not know about"